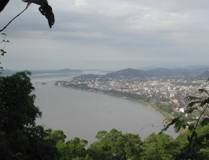 Guwahati is located on banks of the Brahmaputra, which splits the town into two parts of North and South. History says that the reference of this place is made in the epic 'Mahabharata’. Archaeological surveys and the presence of several ancient temples in the region support the conjecture of it being an important city in antiquity.Guwahati was the capital of the demon king Naragashura.The word Guwahati came from two words namely Guwa meaning areca nut and Hat meaning market. This city was first referred by the name Pragjyotishpura followed by Kamarupa and then finally Guwahati.Though the name of the city kept changing during each dynasty the capital remained the same. Bohag Bihu is festival of the Assamese New Year which falls in mid-April. During this festival the markets and homes are flooded with sweetmeats. Durga Puja is also a prominent festival celebrated in the month of October. This is celebrated with great devotion and enthusiasm for a period of nine days. 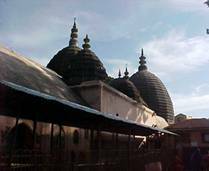 The Ambubashi Mela at Kamakhya Temple celebrate in the months of June-July is a popular festival which attracts pilgrims from all over the India. This temple is at a distance of about 8km away from the railway station placed on the top of Nilanchal hill. This is believed to be the most powerful tantrik shrines of Shakti form of worship in the world. Navagraha Temple - This temple is situated on Chitrachal hill dedicated to "Navagraha" or the "nine planets" worship. It is an important centre of astrology and astronomy. 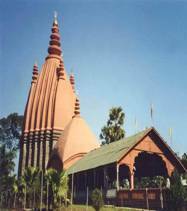 Umananda Temple - This temple is situated on an island in the middle of Brahmaputra and it attract major crowd of tourists with its fascinating view. Vashistha Ashram - This is the resendtial place of where rishi Vashistha lived .There is a temple inside this ashram with waterfall and has a beautiful natural scenario. It is about 12kms from the railway station. This is a magnificent archaeological ruins which is at a distance of about 40 kms from Guwahati. Tourists get to see the carvings of deities lying on a small hillock which are supposed to be erected during the period of Pala dynasty. The Manas National Park is situated about 176 km from the Guwahati city is known for its tiger projects. It is one of the most magnificence parks of India. 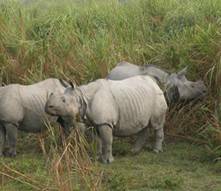 The famous Kaziranga National Park is famous world wide for its one-horned rhino. This widely spread park covering an area of about 450 sq km is situated at a distance of about 200 km from Guwahati. It is one of the major tourist attraction in India. This place is located at about 5km east of the railway station. The zoo accommodates tigers, leopards, Assam's famous one horned rhinos and a rich bird life among other species. The Assam State Museum has collections of archaeology, sculpture, paintings, metal, ivory and woodwork, costumes and ethnology. There are exhibits of reconstructed huts of Assamese tribes. There are also displays of weavings and musical instruments. This museum remains closed on Mondays. This forest more concentrated on the forestry is situated at South Kamrup where you get see collections of timber, cane and ivory work, tusks and horns and models of buildings and bridges. Guwahati University has a commercial Museum with a collection of art and crafts, commercial products, minerals and rocks, coins etc. It is closed on Sundays and University holidays. This lake at a distance of about 64kms from the city is a natural lagoon and a picnic spot which serves well as a holiday resort with entertainments like fishing and rowing. Sualkuchi known as Manchester of the East is one of the world's largest weaving villages located at a distance of about 32 kms from Guwahati. This village is known for its manufacture of Muga - the golden silk of Assam which is not produced anywhere else in the world. 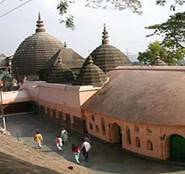 This sacred place for Hindus, Muslims and Buddhists, at a distance of about 28km from Guwahati is situated on the bank of the Brahmaputra. It is known for its bell metal work. This is a Muslim shrine built by Mir Lutufullah-i- Shiraji, in 1657 during the reign of the Mughal emperor Shajahan.This mosque is situated near Hajo and has a tomb of Gyasuddin Aulia who made the first attempts to propagate Islam in this part of the world. The most important feature about this mosque is that the foundation partly consists of some earth brought from Mecca. This leading tea and oil producing district is at a distance of about 369kms away from the city. 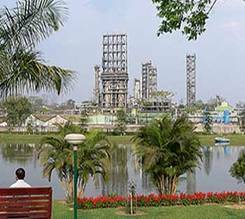 an artificial lake constructed by Queen Madambika in 1734 A.D.
Digboi is known as the first refinery of Asia and as the second one in the world which was established in the year 1901. It is worth visiting this place and get to see the hundred year old Refinery and it's hundred and twelve year old oil field. Tezpur called as Sonitpur is known for its scenic beauty and archaeological ruins. It is also popularly referred as the city of blood. History says that a major war was fought between Hari(Lord Krishna) and Hara (Lord Shiva) and as a result of which the whole city was said to have been drenched in blood. 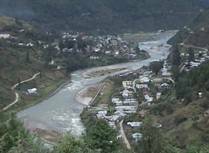 Tezpur is situated on the banks of the river Brahmaputra. This Kalakshetra which signifies a multi art complex. It is at a dispose of a grand exposition of the life and culture of the people of Assam in 1990.This complex is situated at Panjabari. The city of Guwahati has a number of fancy malls and markets in the main city area. The most popular item here in Guwahati includes bamboo and cane products. The other items in the shopping list include furniture, hairclips, fashion accessories, wall hangings, caps and shawls. 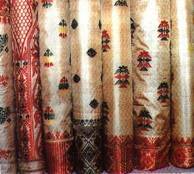 In Guwahati, you can also shop for fascinating apparels made of Assamese silks and cottons with threadwork displaying traditional motifs. The main area of shopping in Guwahati includes fancy Bazaar, Paltan Bazaar, Ulubari, Ganeshavri and GNB Road. There is also couple of government emporiums. 0361 2541115 2.Blue Moon Hotels & Resorts (PVT) LTD.
Telephone – (0361) 2540059, 3.Hotel Chilarai Regency. Guwahati Airport is well connected to many major cities in India, including Delhi, Agartala, Aizwal, Kolkata and Imphal. Delhi and Kolkata are the international airports close to Guwahati; both are nearly 1100 km from Guwahati. International travelers can connect to Guwahati through Kolkata and Delhi. Guwahati’s bustling Paltan Bazaar Railway Station is an important terminus on the North-East Frontier Railway. Guwahati is well connected with all the major cities of India. State bus services connect Guwahati to other major cities in and around. Tourist Volvo bus services are available from Guwahati to many major cities including Darjeeling, which is at a 627 km from Guwahati.